A glorious horseshoe round starting and ending in Kentmere, taking in the skyline of the Kentmere valley. The walk heads out along the Garburn Pass before turning North to reach Yoke, the first summit of the day. From here a succession of fells are passed (Ill Bell, Frostwick and Thornthwaite Crag), before turning East to reach Mardale Ill Bell and then dropping down in to the Nan Bield Pass, which affords views of Haweswater over Small water. Harter Fell is the next peak before turning southwards to complete the Eastern skyline via Kentmere Pike and Shipman Knotts. The length of the walk is rewarded with excellent panoramas from each of the summits. Wainwrights notes that "Many motorists approaching from the south regard their sighting of Windermere as the beginning of the Lake District and head eagerly along the A591 until it comes in to view, unheeding or unaware of a side road signposted 'Kentmere' as they pass through the village of Staveley en route. 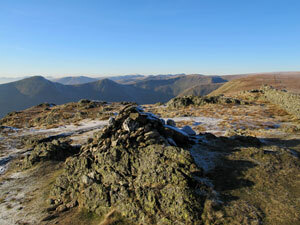 By doing so, they miss the loveliest of the lesser known Lakeland valleys - Kentmere is delightful in all seasons." The A591 may well now bypass Staveley, but this still holds true.